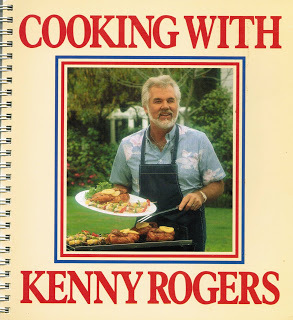 I hardly recognize Kenny Rogers now, but the cookbook photo shows how I remember him from about 20 years ago. I was a fan of Kenny Rogers and The First Edition in high school, which is why I decided to enter a contest sponsored by Dole Pineapple. Kenny was a spokesperson for Dole, and the contest required you to enter a recipe using Dole’s canned pineapple products. The prize was a VIP ticket to see Kenny Rogers in concert, a backstage pass to meet him and have your picture taken with him. I can’t remember what recipe I sent in, but I was happily surprised when I got the call that I had won the contest. The concert was around Christmas time. My husband, Bill, and I had to drive in the snow to get there, but it turned out to be lots of fun. We had front row tickets and went backstage to meet Kenny. He was very pleasant and gracious as we had our photo taken together. He gave me the signed cookbook, along with a bag filled with gifts from Dole. I never did figure out how Kenny Rogers and Dole got together. Did he live in Hawaii or did he just like pineapple? However it started, the cookbook is great. 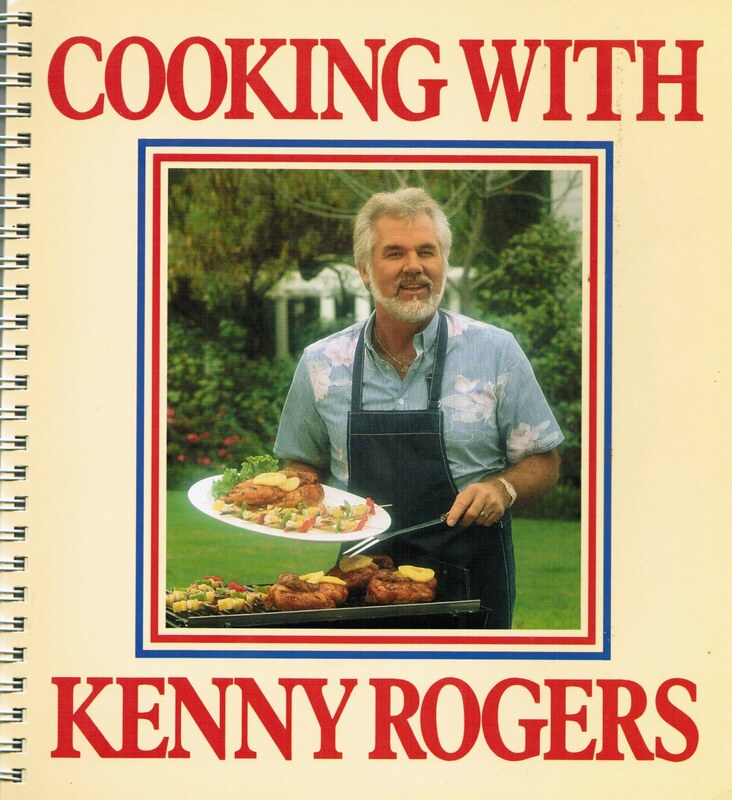 It has beautiful photos of many of the recipes along with photos of Kenny and his family. The recipes begin with breakfasts and brunches through special dinners and dessert. There is a full page in the back of the book of how to cut a pineapple properly, step-by-step. The carrot cake recipe sounds better than any other I have read. There is a full menu for a Backyard Luau for 12. The beverage section has just about every tropical drink you could want. There is one cake recipe that intrigued me, but I haven’t made it yet. It’s called Hawaiian Splendor Sponge Cake. It sounds wonderful and looks so good in the photo. I will include the recipe at the end, and if anyone makes it, please let me know how it tastes. So now fast forward about 6 months from the time I entered the contest. I was at some other contest which I can’t recall now, but I got into a conversation with a man who loved to cook and enjoyed entering cooking contests. We were chatting about contests and he mentioned how he was very picky about what he entered, as he put so much thought and effort into it, that he didn’t want to waste his time on just anything. He then asked me – “Did you see that stupid contest a few months ago to win concert tickets to see Kenny Rogers? What kind of idiot would waste time on that one?” That would be me, I said, as I poured my pina colada down his shirt. I didn’t really do that, of course, but wouldn’t it have felt good? 1. Preheat oven to 350 degrees. Grease a 9-by-13-inch baking pan. 2. In a large bowl, stir together flour, sugar, baking soda, and salt. Add undrained pineapple and eggs. Stir until thoroughly combined. Pour batter into prepared pan. 3. Bake for 30 minutes or until a wooden pick inserted in the center comes out clean. Place pan on cooling rack for 10 minutes. Spread golden frosting over hot cake in pan. Let cake stand until cooled and set. Serves 12. In a saucepan, combine sugar, milk, butter, and vanilla. Bring to a boil. Boil for about 7 minutes, stirring, until mixture is thick. Stir in nuts and coconut. Ive made this cake since I was little and its amazingly moist and sweet. Very delicious.